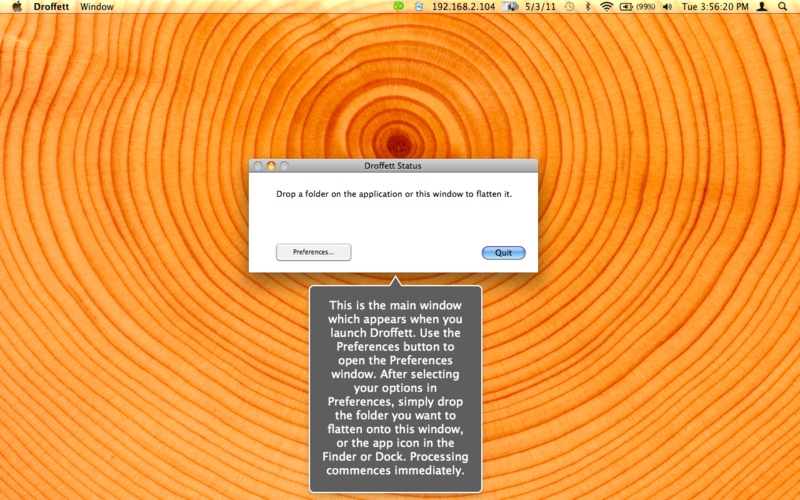 Droffett is a drop application which "flattens" a folder, i.e. moves all files which are descendants of it so that they are directly inside it. Droffett is very easy to use. How to use Droffett: Simply drag a folder on top of the Droffett application icon in the Finder or the main window. Processing commences immediately. • Operation: You can either move the files to, or create aliases of them in, the top level folder. • Treat Bundles as Files: Application packages, bundles, etc. may be condsidered folders, and their contents will also be moved. • Rename Duplicates: Once a file is moved any other files with the same name are not moved or are renamed by appending a unique string. • Aggregate Files By Extension When Done: After the folder is flattened this process will put all files with the same file extension into a folder named by that extension.